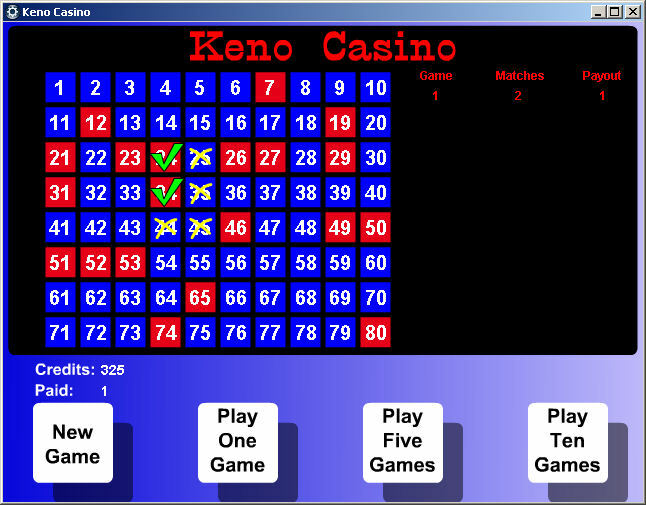 Keno is a simple game where the player picks up to 15 numbers that range between 1 and 80. The computer then picks 20 numbers at random. The player can win credits based on the number of picks he made, and the number of those picks that matched with the numbers selected by the computer. The first thing you do is select your numbers. Below, you can see that the player has chosen 6 numbers. As you select these numbers, the pay table will appear on the right side of the screen. This will show you the number of matches you must get to receive a payout, and the amount that payout will be. In the case below, if the player matches 2 numbers chosen by the computer, he will receive a payout of 1 credit. If he matches 6 numbers, he will receive a payout of 250 credits. As you change the numbers you have selected, this pay table will change, so make sure you check it as you pick your numbers. After the player has chosen his numbers, he may choose to play 1, 5, or 10 games with the numbers he has chosen. When you play a game, you will see the numbers the computer has chosen will appear in red. The numbers that you have chosen that are also chosen by the computer will appear in red with a green check mark over top. Your total credits, and the amount your were paid out for the series of games you just played will appear above the buttons. If you play 5 or 10 games, one game after another will play with the selections you have made. The payouts for each game will be listed on the right side of the screen. Keno Aliens is an alien theme keno game. 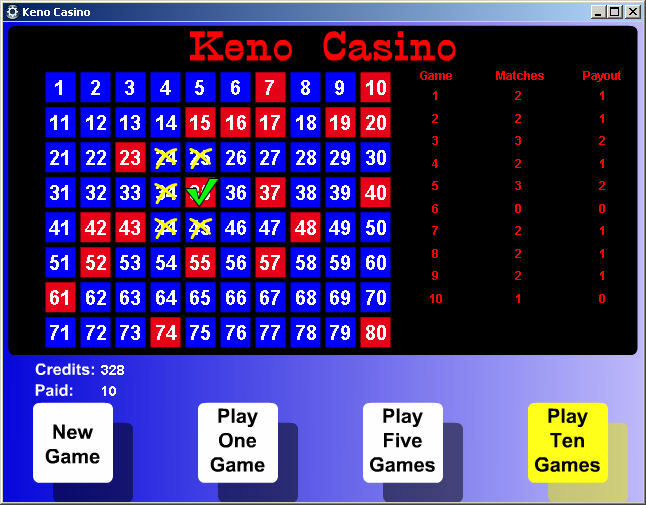 Play up to ten rounds of keno at once. 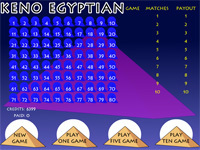 Keno Egyptian is an egyptian theme keno game. 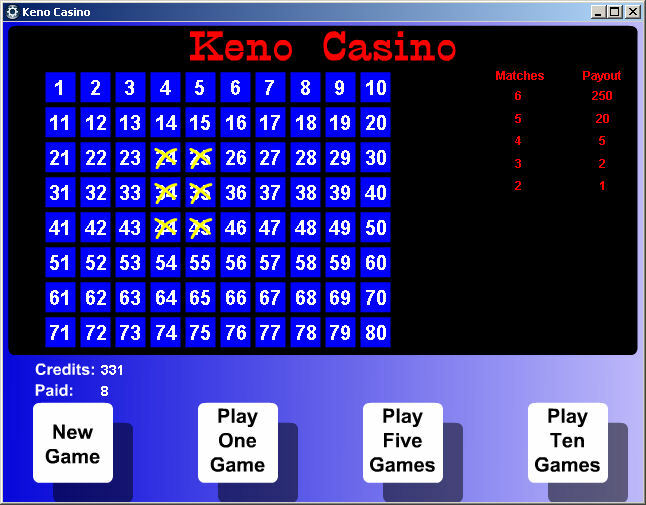 Play up to ten rounds of keno at once. 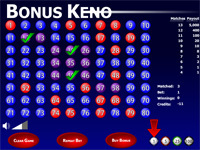 Bonus Keno is a keno game which allows the player to buy additional picks in an attempt to get a higher score and earn more credits. 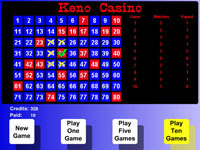 Keno is a lottery like casino game where the player picks a series of numbers from a card. Numbers are drawn randomly and the player receives a payout if his correct picks exceeds a certain threshold. The more correct picks a player chooses, the higher his payout.